An estimated 9.4 million television viewers tuned in on Easter Sunday 2018 to see John Legend, Sara Bareilles, Alice Cooper, Brandon Victor Dixon and a large cast of superstar performers give television life to Jesus Christ Superstar Live on NBC. The timeless, iconic songs and a large live studio audience made the performance differ from previous live broadcast musicals NBC has produced: The Sound of Music Live (2013), Peter Pan Live (2014), The Wiz Live (2015) and Hairspray Live (2016), all performed and broadcast live, but without a live audience, from the Grumman Studios in Bethpage, NY. Jesus Christ Superstar Live was not only performed live, it included a live audience. Close to 1,300 saw the show on Easter Sunday as it unfolded before the cameras on an elaborate set constructed within the Marcy Avenue Armory in Brooklyn’s Williamsburg neighborhood. Providing the beautifully designed mural walls, major amounts of scaffolding elements, lighting and scenic automation was a company that is growing exponentially but still considers itself small enough to be personally invested in every project. That company is United Staging and Rigging. 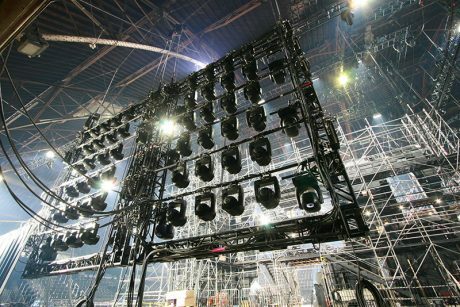 United Staging and Rigging began in 1986 in Norwalk, CT with a mission to serve the New York City theatrical market as a reliable source of staging, chain motors and other theatrical equipment. After 13 years of successful business operations and relationship-building, the company opened a second office was opened in Boston in 1999, serving the New England market. The company has continued to grow and, in 2004, they added their Retail Sales department to provide expendables along with trade show and theatrical supplies. In that 30-plus-year span, they have taken on projects requiring anything from sales to project management, fabrication and implementation. 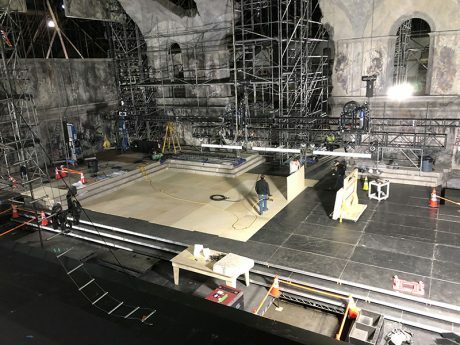 Along with United Staging and Rigging owner Jon Sharp, PLSN reached out to others at the company for their take on NBC’s Jesus Christ Superstar Live project. These crew members included Chris Whitacre, the company’s head production rigger on Jesus Christ Superstar Live; Todd McDonald, general manager of the Connecticut office, who also serves as the company’s fall protection and rescue plan administrator; and Tag Mendillo, the company’s business development associate. Pods of lights backlight the scaffolding. The production at Marcy Ave. Armory in Brooklyn, NY was broadcast live and included a live audience. PLSN: How did you get involved with this production? The crew erects the stage. One of the main differences between NBC’s previous televised live musicals and this event was the inclusion of a live audience, which created particular challenges for the production team, Sharpe notes. Jon Sharpe: “When we had worked on these shows in the past, there was no live audience — that particular aspect added a different element for the planning and execution for the production that we knew had to be right. United Staging and Rigging transformed the Brooklyn Armory’s cavernous interior. What were some of United Staging and Rigging’s duties? Jon Sharpe: “Our particular component of the show was the staging decking under the scenery, all of the overhead rigging for lighting and scenery and all of the audience seating. The challenges in the design and in the venue, which were overcome by meticulous planning by our people — like the rigging and automation for the large scenic walls from Scenic Technology and the large upstage lighting walls that required a high level of planning and execution from our team. Did you encounter any issues or challenges during load-in for this major installation? Jon Sharpe: “We were very lucky to have a venue like The Armory to work in. Initially, we could pull entire semi-trucks in and turn them around, which made for the start of an incredible load-in. Obviously, though, as components got assembled, space filled up quick as the deck came in and was put in place. Can you share a little about the future direction for United Staging and Rigging? McDonald also noted the company’s growth. Jon Sharpe: “We focus hard on what we do — we’re not trying to be everything to everybody. We focus on rigging and staging, we focus on what a production rigger is going to need for the bag of tricks and tools they need to perform flawlessly. We don’t do lighting; we don’t do sound. We specialize in rigging and staging, and we speak that language fluently, daily. We analyze problems to come up with creative solutions and keep a wide array of tricks up our sleeves to accomplish these things for our clients and their shows. On the staging side, it’s the same thing — we get down and dirty with the math and the technology to provide the structural integrity that’s required. This is the side of the business where we excel, that’s where our passion lies.